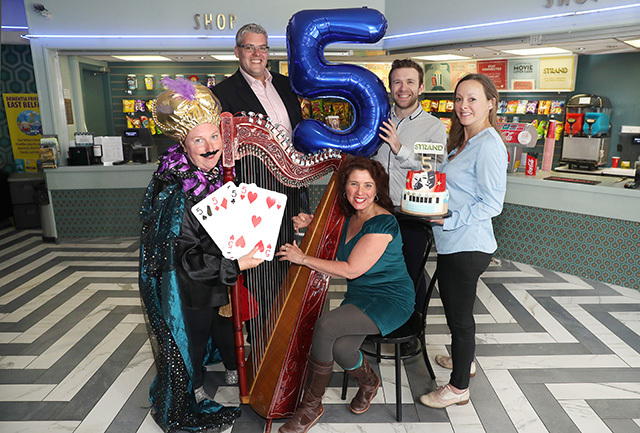 From an intimate gig with Van Morrison and the premiere of Good Vibrations to creative activities for kids and large-scale youth musicals, no two days have been the same at the Strand Arts Centre, currently celebrating its fifth birthday. The not-for-profit charity took over the tenancy of Northern Ireland’s oldest cinema building in 2013 with the aim of securing both its short-term survival and long-term redevelopment. Since then it has enjoyed a new lease of life as East Belfast’s only dedicated arts venue. Almost 60,000 people each year now attend a busy programme of live theatre and music, performing arts classes and filmmaking workshops for children in addition to film screenings. The Strand is widely used by many festivals and by the local community for school visits, local film premieres and charity fundraising events. “The Strand has enjoyed tremendous support from the people of East Belfast and beyond since we opened our doors. We’ve demonstrated an overwhelming appetite for more live entertainment and community engagement for all ages, from our Saturday Minors Club for families to Silver Screenings for older audiences, proudly supported by Specsavers Connswater. “All of this, however, has been delivered in a building that is physically deteriorating, has limited disabled access, and inadequate facilities to meet the demand for its activities. An important first step towards securing the Strand’s future has been made with Belfast City Council’s offer of £1.8 million from its Belfast Investment Fund. The overall project cost is estimated at £4.2 million. Leading figures from the creative industries, tourism and the East Belfast community are urging support for the Strand’s proposed redevelopment. Strand Arts Centre is encouraging its audiences, past and present, to share their memories and future aspirations for the building. You can find out more about the Strand's plans and how to share your memories at www.strandartscentre.com or on social media.